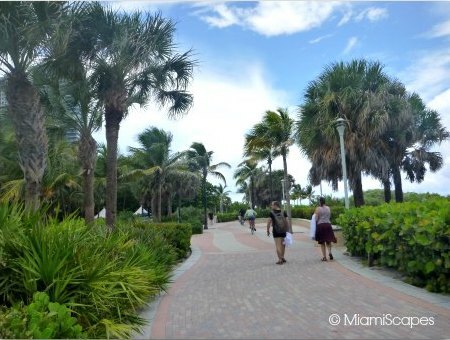 One of the most fantastic features of this city is the path that runs along the eastern shore of Miami Beach, which consists of paver roads, boardwalks, sandy stretches, biking paths and promenades. 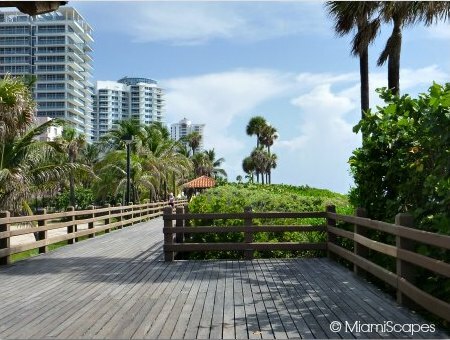 Most commonly known as the Miami Beach Boardwalk, it "officially" runs from 5th Street in South Beach to 46th Street at Indian Beach Park. The original wooden boardwalk first ran the stretch in Mid-Beach from 23rd to 46th Streets. Then multiple waterfront promenades and paver paths popped up here and there, in South Beach, South Pointe Park, etc. 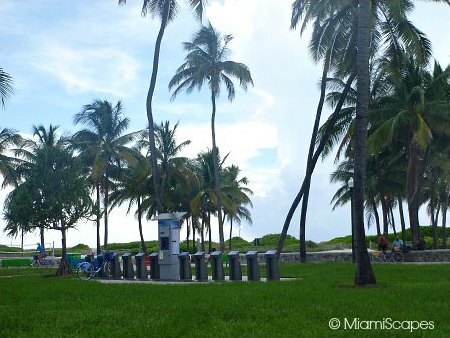 They enable you to go from the southernmost part of the island at South Pointe Park all the way to the very tip up north at Bal Harbour, (give and take a few blocks here and there) and passing through all the popular spots in between: South Beach, the Ocean Drive promenade, Mid-Beach, North Shore Open Park, Surfside. This 10-mile stretch is what is shaping into the Miami Beach Walk, and takes advantage of the existing venues, namely the paved paths, sandy stretches, park promenades and elevated boardwalks. So in effect, the Miami Beach Walk takes up where the Miami Beach Boardwalk left off. Here are more details for each segment, access points, facilities, current status. As you can see from the above, the Miami Beach Walk is actually a project that is still coming together and is part of a larger future network of bikeways. The ultimate goal is to provide a continuous coastal pathway that will link the southernmost point in Miami Beach all the way to Ft. Lauderdale and we are certainly looking forward to it! Although there are still a couple of sections to be completed, and not all segments are bike-friendly yet, the Beach Walk can be enjoyed by visitors all along the stretch. For the parts that are not 100% finished, it is just a matter of taking a small detour and reconnect at a later point. So whether you go the entire stretch or just pick a couple of blocks here and there, it will be a very enjoyable stroll. You will see joggers, skaters, and cyclists all taking in the fresh ocean breezes, fantastic vibe and beautiful sights. ...You can also stop for a drink or refreshment along the way, although the watering holes are few and far between. 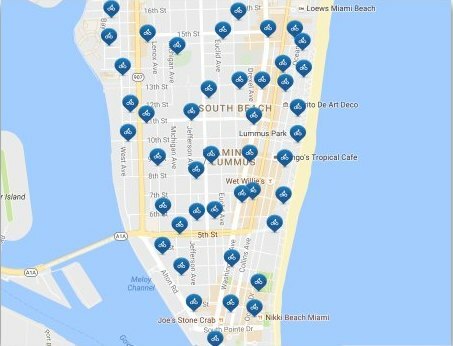 Many hotels are located along the Miami Beach Walk; however, many restrict access to guests only, you cannot just walk in from the Beach Walk to the pool bar and have a drink. In these cases, access is through their main street entrances, i.e. Collins Avenue. This is probably one of the most beautiful bike rides you can take in the city. 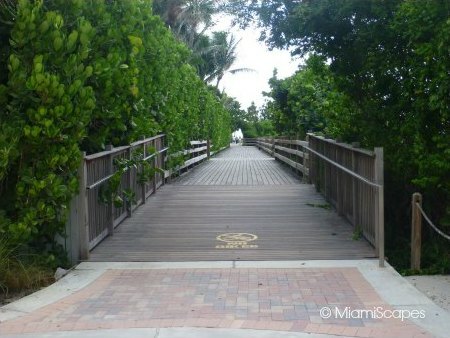 At this time, not all the segments of the Beach Walk are open to cyclers, specially the Miami Beach Boardwalk area in Mid-Beach which is limited to pedestrians only. Work is underway to replace the existing boardwalk with a paved pathway, which will be wide enough to allow for bicycles. Many paved segments are already finished or closed to being completed. You will see the areas clearly marked where bicycles are not allowed. Bicycles can be rented from one of the many Citibike stands. Remember you can rent and return your bike to any of the stands (as long as there are bikes or empty spots available for returning). 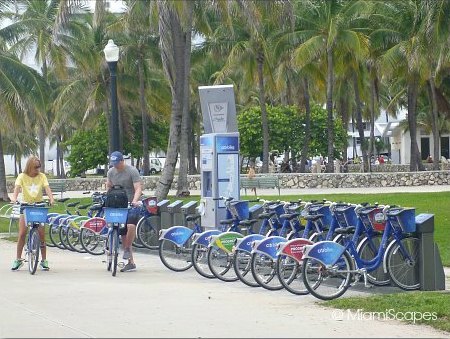 Bikes might be in short supply in some of the most popular stretches in South Beach, where empty racks are a common sight as early as mid-morning. But it is not much of a problem as there are numerous stations throughout the area. You can download the Citibike App which tells you which stations have bikes available and how many. More info www.citibikemiami.com. There are literally hundreds of access points, the paved paths, boardwalk and promenades run parallel to the shoreline so if you simply head to the beach you will certainly run into it. 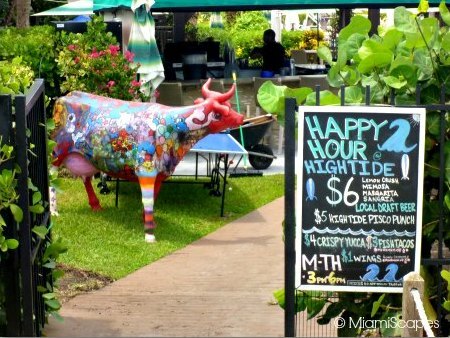 If you are staying in Miami Beach, just head out towards the ocean. Many of the public beach access points will lead you to the Beach Walk, which also runs along the back of many of the waterfront hotels. 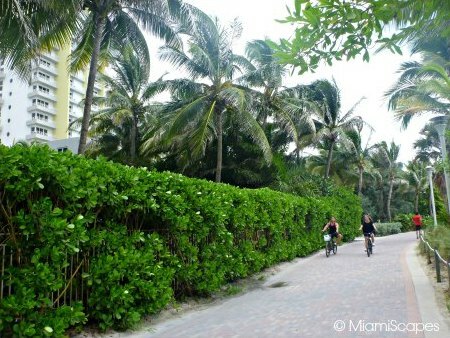 Click here for more details on what's available along the different stretches of the Miami Beach Walk.